DESCRIPTION -- Dating from the 1950's this is a very early type souvenir from the RMS Queen Mary which is a china ashtray. 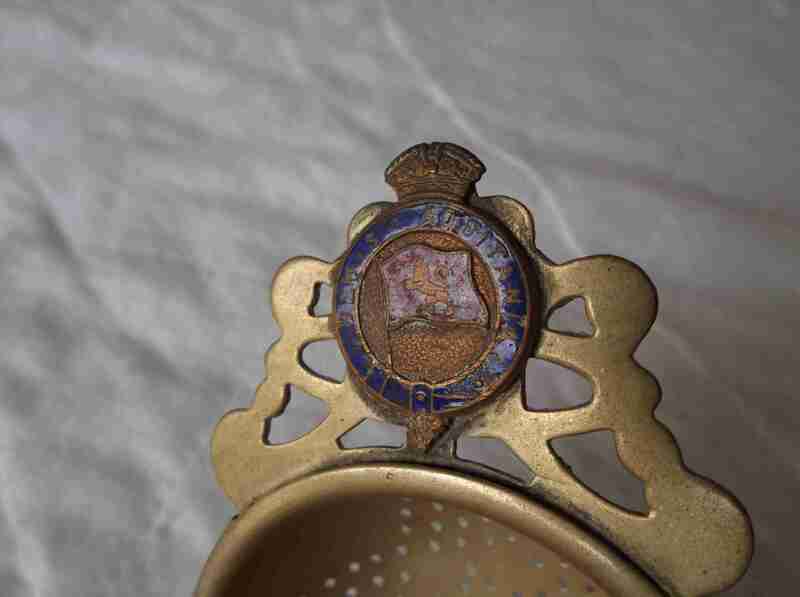 Purchased on board this item is in a very good condition and the size is 5" (13cm) wide. HISTORY -- The Queen Mary's creation and launch was nothing if not extraordinary and her story is rich with history, elegance and grandeur. From the time her construction began in 1930 in Clydebank, Scotland, the Queen Mary was destined to stand in a class all her own. Despite suffering economic setbacks during the Great Depression, which stalled construction on the ship for several years, Cunard Line spared no expense on building the Queen Mary - which was originally known as job #534. 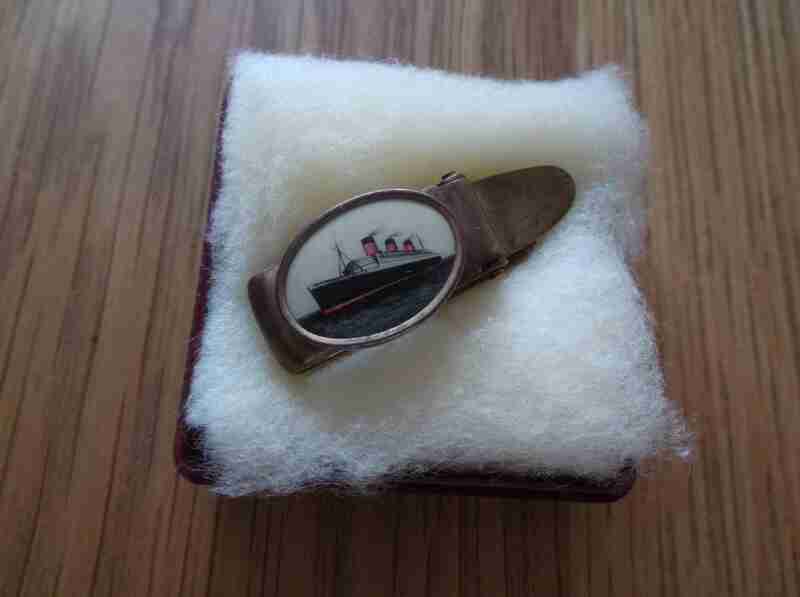 DESCRIPTION -- Dating from the 1950's this is a great souvenir propelling pen from the RMS Queen Elizabeth which would prbably have been purchased on board. This item is in a very good condition and is boxed in original packaging but has lost its fluid from the end of the pen. HISTORY -- RMS Queen Elizabeth was an ocean liner operated by the Cunard Line (after its merger with the White Star Line). Along with her sister ship Queen Mary, she provided luxury liner and immigrant service between Southampton, England (UK), and New York, New York (US), via Cherbourg, France on Continental Europe. She was also contracted for over 20 years to carry the Royal Mail, thus enabling her to carry the prestigious Royal Mail Ship (RMS) designation, as the second half of the two ships' weekly express service. DESCRIPTION -- Early Triang model from the 1950's/60's and is of the RMS Queen Mary which is in a good condition and the size is 10" (26cm) long. HISTORY -- RMS Queen Mary is a retired ocean liner that sailed primarily on the North Atlantic Ocean from 1936 to 1967 for the Cunard Line (known as Cunard-White Star Line when the vessel entered service). Built by John Brown & Company in Clydebank, Scotland, Queen Mary along with her sister ship, RMS Queen Elizabeth, were built as part of Cunard's planned two-ship weekly express service between Southampton, Cherbourg, and New York City. 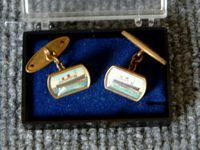 DESCRIPTION -- From the old and famous vessel the RMS Queen Elizabeth this is a pair of souvenir cuff links which are in a good condition and are a great find and unlikely to see another pair (click on the picture to see a close up view). DESCRIPTION -- From the RMS Aquitania this is a rare find and is a souvenir tea strainer showing the company houseflag and name at the top and is in a good/fair condition for an old item (click on the picture to see a close up of the houseflag and name). HISTORY -- RMS Aquitania was a Cunard Line ocean liner built by John Brown & Company in Clydebank, Scotland. She was launched on 21 April 1913 and sailed on her maiden voyage to New York on 30 May 1914. Aquitania was the third in Cunard Line's "grand trio" of express liners, preceded by the RMS Mauretania and RMS Lusitania, and was the last surviving four funnelled ocean liner. DESCRIPTION -- This item is a great find and an original early souvenir from the period. 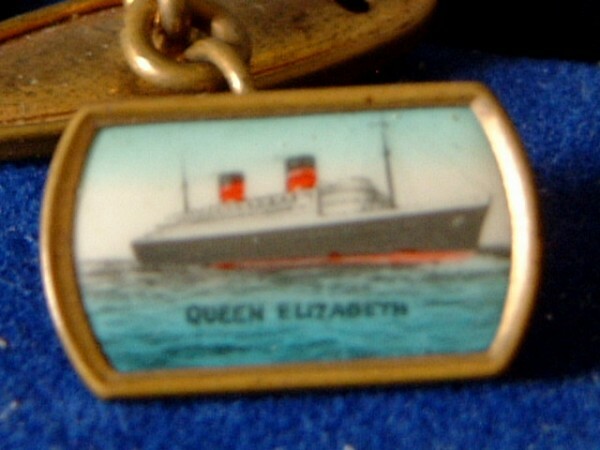 It is an 'as purchased on board' souvenir tie clip showing on it a picture of the vessel the RMS Queen Mary and the name and is an early souvenir from her launch days. In very good condition and not many seen around for sale. HISTORY -- In 1934 the new liner was launched by Queen Mary as RMS Queen Mary. On her way down the slipway, Queen Mary was slowed by eighteen drag chains, which checked the liner's progress into the Clyde, a portion of which had been widened to accommodate the launch. When she sailed on her maiden voyage from Southampton, England on 27 May 1936, she was commanded by Sir Edgar T. Britten, who had been the master designate for Cunard White Star whilst the ship was under construction at the John Brown shipyard. DESCRIPTION -- This item is in an excellent as new condition and in original box. 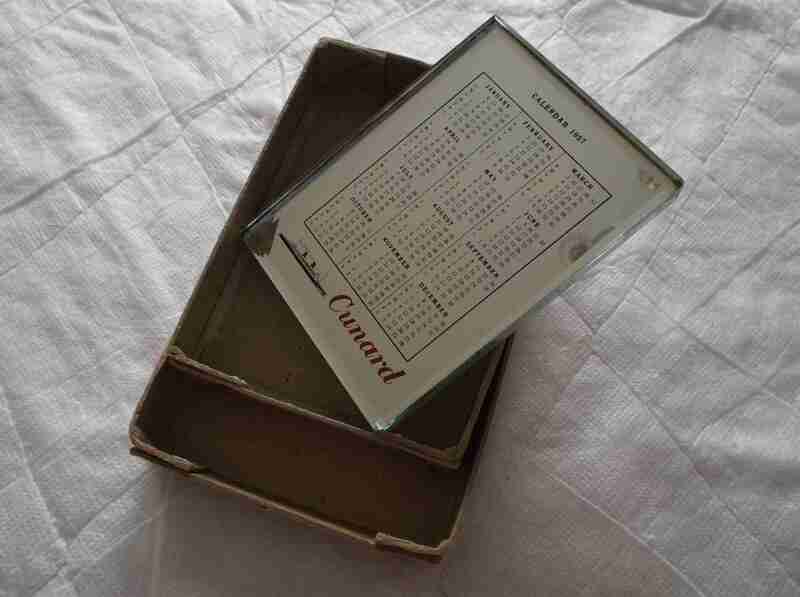 It is a glass paperweight desk calendar souvenir from the Cunard Line and is boxed and unused. An early souvenir object and it shows the years 1957/1958 and has company name on front. DESCRIPTION -- In the original box this is a set of playing cards from the Cunard Line vessel the QE2. HISTORY -- The Queen Elizabeth 2, often referred to simply as QE2, is a retired ocean liner built for the Cunard Line which was operated by Cunard as both a transatlantic liner and a cruise ship from 1969 to 2008. She was designed for the transatlantic service from her home port of Southampton, UK, to New York, and was named after the earlier Cunard liner RMS Queen Elizabeth. DESCRIPTION -- Dating from the 1960's this is a round dish souvenir from the ship the Cunard Countess. The size is 4" (10cm) and it is in a very good condition. 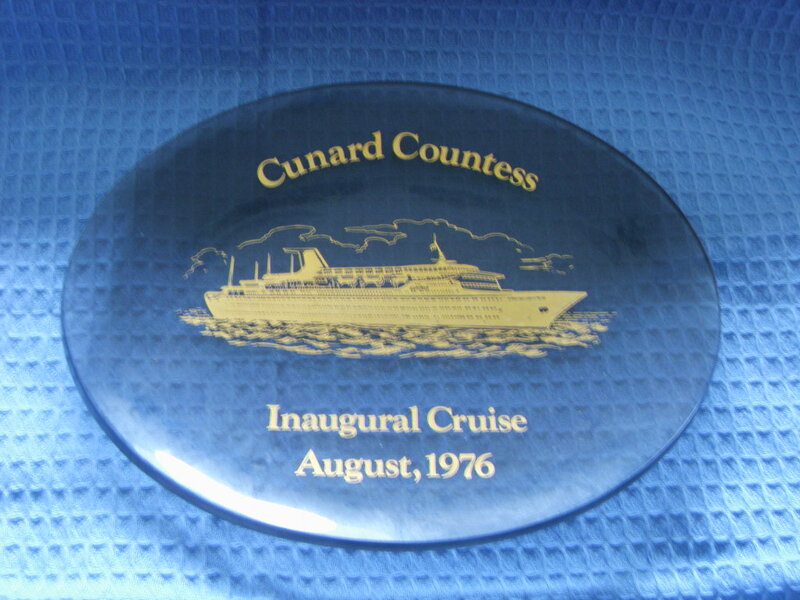 HISTORY -- The ship was completed in 1976 as Cunard Countess for Cunard Line and was a popular ship in the Caribbean cruise market for 20 years. After leaving Cunard service in 1996 she had a number of owners before being purchased by Majestic in 2004. Ocean Countess then enjoyed many years as a cruise ship owned by Majestic International Cruises of Greece. 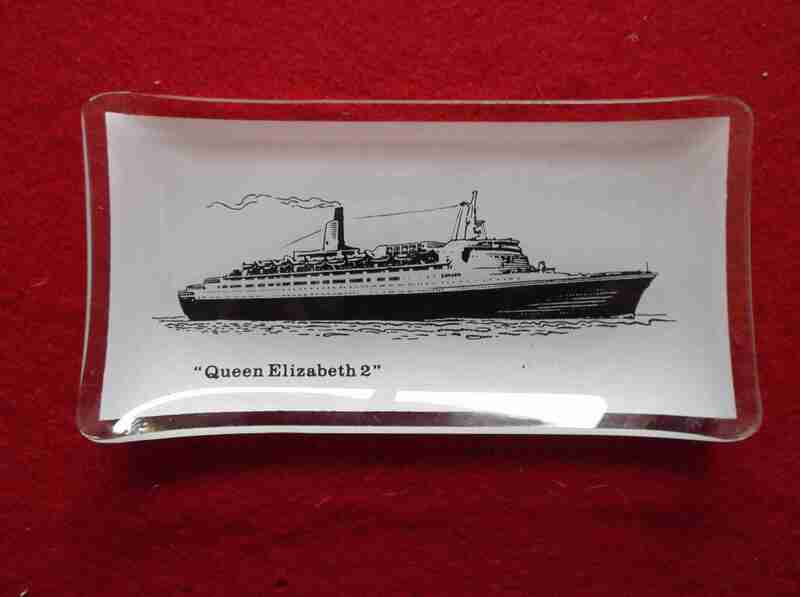 DESCRIPTION -- A souvenir from the Cunard Line vessel the QE2 which is a glass oblong dish which is 6" (16.5cm) x 3" (8.5cm) in size. The glass dish shows on it a picture and name of the vessel and is in an excellent condition. HISTORY -- Queen Elizabeth 2, often referred to simply as QE2, is an ocean liner built for the Cunard Line which was operated by Cunard as both a transatlantic liner and a cruise ship from 1969 to 2008. She was designed for the transatlantic service from her home port of Southampton, UK, to New York, and was named after the earlier Cunard liner RMS Queen Elizabeth. She served as the flagship of the line from 1969 until succeeded by RMS Queen Mary 2 in 2004.